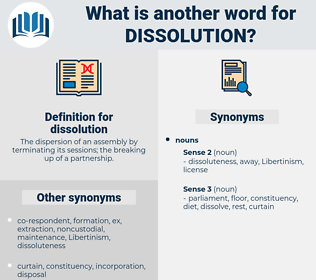 What is another word for dissolution? The dispersion of an assembly by terminating its sessions; the breaking up of a partnership. disappearance, divorce, demobilization, extinction, annulment, decommissioning, elimination, revocation, fragmentation, deletion, destruction, dislocation, rescission, removal. 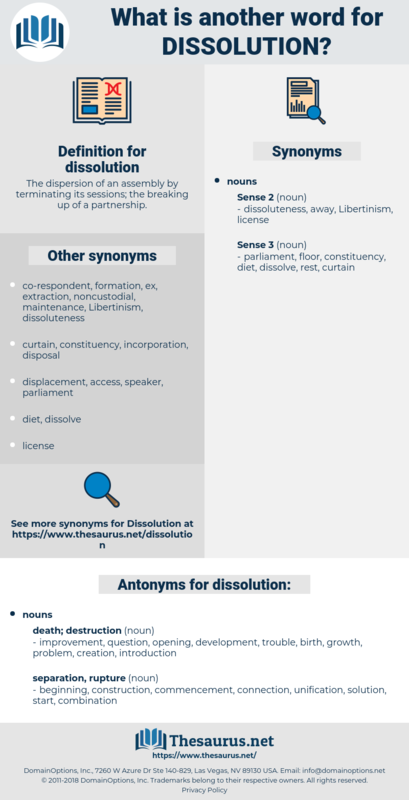 break-up, breakup, liquidation, dilution, dismemberment, disbandment, collapse, demise, disruption, dismissal, cancellation, closure, nullification, discontinuation, winding-up, abolishment, melting, dismantling, scrapping, decomposition, breaking. improvement, question, opening, development, trouble, birth, growth, problem, creation, introduction. beginning, construction, commencement, connection, unification, solution, start, combination. attachment, sanctioning, assemblage, establishment, commandment, rise, formalization, mandating, nativity, founding, life, legitimation, passing, linkage, approval, legitimization, fusion, ratification, validation, endorsement, ordering, clearance, permission, conjunction, origination, prescription, enactment, institution, existence, legalization, aggregation, link, authorization, legislation. The dissolution was refused; the Brown - Dorion government resigned, and the old ministers were restored to office. Two years ago, then, I faced in Verona the dissolution of my ineffectual existence. activity, action, natural action, natural process.